Ordinated as a priest in 1899, Bernhard Lichtenberg spent more than forty years working in pastoral care in Berlin, his last position being the cathedral provost at St. Hedwig’s Cathedral. During the Weimar Republic he represented the Catholic Center Party on the Berlin-Charlottenburg local council and was a member of the Peace Association of German Catholics and the Interdenominational Syndicate for Peace. The National Socialists first searched his home in 1933. 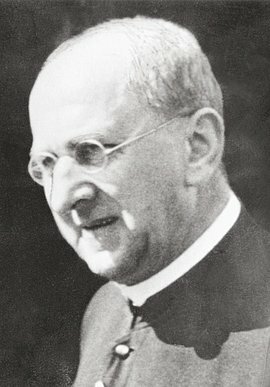 A strict opponent of the Nazi regime, from 1935 Lichtenberg became a trusted friend of the new Bishop of Berlin, Konrad Graf von Preysing. In 1941 he emphatically protested the murder of people with mental illnesses in a letter to Leonardo Conti, the Reich Head of Medical Affairs. The Gestapo, which kept Lichtenberg under surveillance because of his courageous support of prisoners and Jews, arrested him on October 23, 1941 after he was denounced by an informer. The 1st Special Court at the Berlin Regional Court sentenced him to two years’ imprisonment on May 22, 1942, which he served in Berlin-Tegel and the Wuhlheide labor education camp. He was then transferred to Dachau concentration camp. Severely ill, Father Lichtenberg died on the way to the camp in Hof/Saale in 1943.